After seeing the Fonkraft project, it doesn’t seem that only Google is working on its Modular Smartphone concept called Project Ara, others are also working to take the lead. 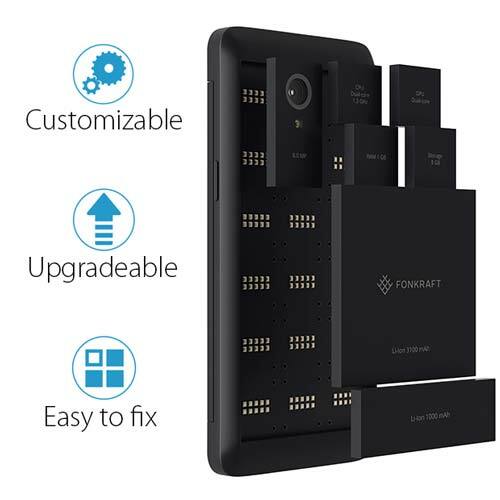 Fonkraft is an Indiegogo project; it is a modular smartphone phone, which seems to look like Google Ara but has some differences in the design. The main difference is that, the Fonkraft modules can be placed anywhere i.e. users will be able to swap components to make the adjustments as needed. Since the modules are interchangeable therefore, you can replace any module with your desired one or simply upgrade whenever you want. The components, which can be able to swap out, include CPU, RAM, GPU, camera, battery, and so on. The ready prototype of Fonkraft is the base model called Pilot which comes with 4,100mAh battery, an 8MP rear-facing camera, a 2MP front-facing camera, and a 1.3GHz dual-core chipset with 1GB of RAM and 8GB of storage. On the other hand, the higher model called Element comes with all the modules available at that time so that user can easily swap out the components. Since the various Fonkraft models differ in configuration, therefore, they all have different price starting from $99 for Pilot to $300 for Element. Fonkraft is still an Indiegogo Project, which needs your crwodfunding to bring it soon to the market and bring some more modifications to the project.